Black Friday is coming up in two days. Big and small retailers nationwide will be offering some very attractively-priced sale items. First, definitely check out Sinclair International’s Cyber Weekend Sale. You’ll find great deals on everything from bullets to electronic powder measures. And you can use Code DUS to save 10% on orders over $150.00. Along with the well-known vendors of shooting supplies, readers can find some great deals on general equipment for their reloading centers. Check out tool sales at Sears, for example. And here are two sweet deals from Harbor Freight. 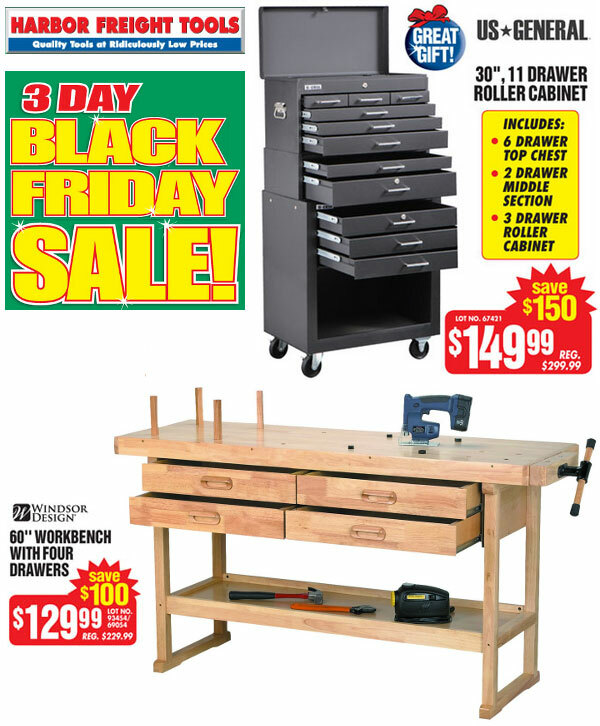 A rolling tool chest is marked down from $299.99 to $149.99 and the Windsor 60″ Workbench is now just $129.99. That’s $100 off the regular price. These sale prices are good for three (3) days: Friday November 23 through Sunday, November 25th. Share the post "Sinclair’s Cyber Weekend Sale and Hot Buys at Harbor Freight"
Webyshops.com just let us know about a very special deal — FFP Mildot Spotting Scopes priced way below the original U.S. Army contract price. This is an excellent deal for guys looking for a spotter with mildot ranging ability. 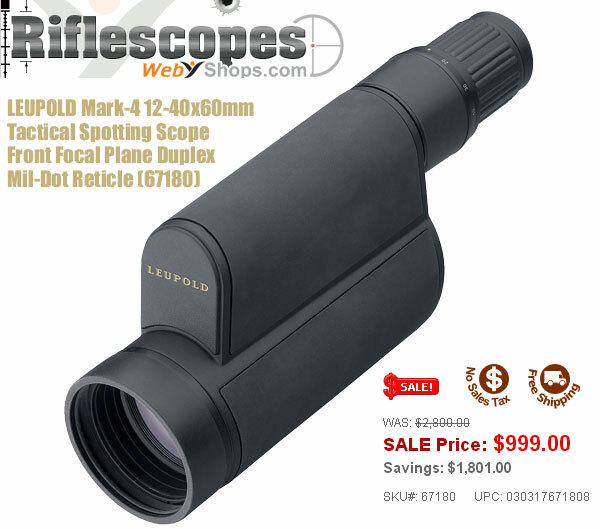 Webyshops’ buyer tells us: “We picked up a limited number of Leupold spotting scopes (it was originally a military order and they decided not to take all or did not get the budget approved for all). 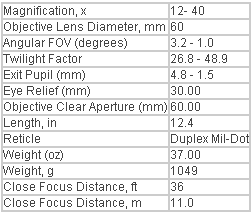 It has a First Focal Plane Duplex Mil Dot Reticle. Normal retail price is $2800.00. We have them available on a first come, first serve basis for $999.” CLICK HERE for more info. The rugged, waterproof Leupold Mark 4 Tactical spotting scope is currently in service with several branches of the U.S. military. The LEUPOLD Mark-4 12-40×60 Tactical Spotting Scope, Duplex Mil-Dot Reticle (67180) utilizes a front focal Duplex Mil-Dot Reticle. With the reticle located in the front focal plane, the reticle magnifies with the image, so you can calculate range at any power setting. Xtended Twilight lens system provides high definition and superior luminance. Very compact design (12.4″ long). Ranging capability at ALL power settings. Includes soft-side protective case which remains on the scope during use. Share the post "Leupold Mark-4 FFP 12-40x60mm Spotting Scopes on Sale"
USA Shooting President and two-time Olympic gold medalist Gary Anderson was awarded the International Olympic Committee’s (IOC) Olympic Order on Thursday. 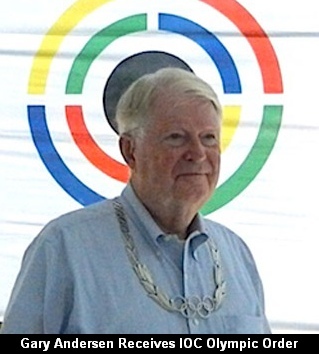 ISSF President Olegario Vazquez Raña presented the Olympic Order to Anderson in Acapulco, Mexico at an ISSF meeting. The Olympic Order (for distinguished contributions to the Olympic Movement), is the IOC’s highest individual award. Worn around the neck like a garland, the IOC Olympic Order features the five Olympic rings framed by olive branches. “Gary Anderson has devoted his life to sport, both as an athlete and as a sports administrator in the USA and at the International Shooting Sport Federation,” said Raña. “He has placed his knowledge and experience as an elite athlete at the service of sports administration.” Anderson was a member of the USA Shooting Team for 10 years (1959-1969) and earned two Olympic gold medals in Tokyo (1964) and Mexico City (1968). He also claimed seven World Championship medals, two Pan American Games titles, 16 National Championship titles, and six individual World Records in his career. Anderson served as the Director of the Civilian Marksmanship Program (CMP) from 1999 to 2009. Anderson’s influence on shooting sports extends well beyond the United States. He has traveled extensively throughout his career in shooting, serving as a genuine ambassador for shooting sports, attending 12 Olympic Games, three as a competitor and nine as technical delegate or a jury member. Anderson has served USA Shooting as President since 2009. At the international level, he joined the international shooting family in 1978 as member of the ISSF Administrative Council, and is now serving the international federation as Vice President. Share the post "Gary Anderson Receives IOC’s Olympic Order"